Penguin Press, 2008. Hardcover: 352 pages. ISBN: 1594201722; 9781594201721. The author of Free Culture shows how we harm our children—and almost anyone who creates, enjoys, or sells any art form—with a restrictive copyright system driven by corporate interests. Lessig reveals the solutions to this impasse offered by a collaborative yet profitable “hybrid economy”. Lawrence Lessig, the reigning authority on intellectual property in the Internet age, spotlights the newest and possibly the most harmful culture war—a war waged against our kids and others who create and consume art. America’s copyright laws have ceased to perform their original, beneficial role: protecting artists’ creations while allowing them to build on previous creative works. In fact, our system now criminalizes those very actions. For many, new technologies have made it irresistible to flout these unreasonable and ultimately untenable laws. Some of today’s most talented artists are felons, and so are our kids, who see no reason why they shouldn’t do what their computers and the Web let them do, from burning a copyrighted CD for a friend to “biting” riffs from films, videos, songs, etc and making new art from them. Criminalizing our children and others is exactly what our society should not do, and Lessig shows how we can and must end this conflict—a war as ill conceived and unwinnable as the war on drugs. By embracing “read-write culture,” which allows its users to create art as readily as they consume it, we can ensure that creators get the support—artistic, commercial, and ethical—that they deserve and need. Indeed, we can already see glimmers of a new hybrid economy that combines the profit motives of traditional business with the “sharing economy” evident in such Web sites as Wikipedia and YouTube. 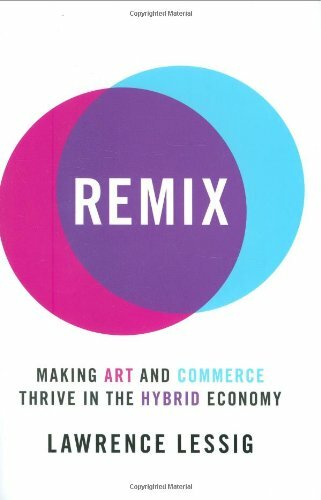 The hybrid economy will become ever more prominent in every creative realm—from news to music—and Lessig shows how we can and should use it to benefit those who make and consume culture. Lawrence Lessig is a Professor of Law at Stanford Law School and founder of the School’s Center for Internet and Society. He is the author of Free Culture, The Future of Ideas, and Code and Other Laws of Cyberspace, and is a columnist at Wired. He chairs the Creative Commons project and has won numerous awards, including the Free Software Foundation’s Freedom Award. He was named one of Scientific American’s Top 50 Visionaries and has also been listed as one of BusinessWeek’s “eBiz 25,” the magazine’s roundup of the twenty-five most influential people in electronic business, several times.